The Screen Plate Well (SPW) model is designed to support High Content Screening (HCS). It is aimed at providing a flexible framework to organize the images that result from such a screen and link to external systems that contain full information about the components and products used. Throughout the model, there are several External Identifier strings that can be attached to support this. The top level of the SPW model has two objects that exist side by side - Screen and Plate. It is important to stress that Plate is not a child of Screen, they are equals. This is necessary to cater for the fact that while a Screen can contain many Plates, a Plate can also be used in more than one Screen. This allows less common scenarios where, for example, there are two screens against two different reagent sets but only one set of control plates that are used in common. Reagents are children of a Screen and as such are designed to be referenced from each Screen they are part of. It is worth covering the exact meaning of a Reagent within SPW. The storing of detailed information about biological reagents is beyond the scope of the OME model. There are several other systems that are designed to handle this type of information. What the Reagent element in SPW provides is useful descriptions and an external reagent identifier, that can be used to find detailed information about the reagent in another system. A side effect of this is that any change to an external reagent requires a new SPW reagent. This could be a change of dilution, supplier, or lot-number. Refer to OME-XML downloads to find sample files for different combinations of Screens, Plates and Wells. ID - used by the system to identify the plate. Name - chosen by the user to identify the plate. Description - a free text description. ColumnNamingConvention - the column naming convention. Columns - the number of columns in the plate. ExternalIdentifier - an identifier for the plate used by an external system. This may be a barcode printed on the plate by the manufacturer. RowNamingConvention - the row naming convention. Rows - the number of rows in the plate. Status - the current state of the plate in the experiment work-flow. WellOriginX - the X position to use for the origin of the fields (individual images) taken in a well. WellOriginY - the Y position to use for the origin of the fields (individual images) taken in a well. ID - used by the system to identify the reagent. Name - a short name for the reagent. Description - a long description for the reagent. ReagentIdentifier - a reference to an external (to OME) representation of the Reagent. It serves as a foreign key into an external database. ID - used by the system to identify the screen. Name - chosen by the user to identify the screen. Description - a long description for the screen. ProtocolDescription - a description of the screen protocol; may contain very detailed information to reproduce some of that found in a screening database. ProtocolIdentifier - a pointer to an externally defined protocol, usually in a screening database. ReagentSetDescription - a description of the reagent set; may contain very detailed information to reproduce some of that found in a screening database. ReagentSetIdentifier - a pointer to an externally defined reagent set, usually in a screening database/automation database. Type - a human-readable identifier for the screen type e.g. RNAi, cDNA, SiRNA. PlateAcquisition is used to describe a single acquisition run for a plate. Since Plates are abstract, this object is used to record the set of images acquired in a single acquisition run. The images for this run are linked to PlateAcquisition through WellSample. ID - used by the system to identify the plate acquisition. Name - chosen by the user to identify the plate acquisition. EndTime - time when the last image of this acquisition was collected. MaximumFieldCount - the maximum number of fields (well samples) in any well in this PlateAcquisition. A Well is a component of the Well/Plate/Screen construct to describe screening applications. A Well has a number of WellSample elements that link to the Images collected in this well. The ReagentRef links any Reagents that were used in this Well. A Well is part of one or more Plates. The origin for the row and column identifiers is the top left corner of the plate, starting at zero. ID - used by the system to identify the well. Color - a marker color used to highlight the well. Column - the column index of the well; the origin is the top left corner of the plate with the first column of cells being column zero i.e top left is (0,0). ExternalDescription - a description of the externally defined identifier for this plate. ExternalIdentifier - a pointer to an externally defined identifier for this plate. Row - the row index of the well; the origin is the top left corner of the plate with the first row of wells being row zero i.e top left is (0,0). Status - a human-readable identifier for the screening status e.g. empty, positive control, negative control, control, experimental. This string is likely to become an enumeration in future releases. ID - used by the system to identify the well sample. Index - records the order of the well samples. Each index should be unique for a given plate but they do not have to be sequential. PositionX - the X position of the field (image) within the well relative to the well origin defined on the Plate. PositionY - the Y position of the field (image) within the well relative to the well origin defined on the Plate. Timepoint - the time-point at which the image started to be collected. In the previous version of the SPW Model, the acquisition information was recorded below Screen. During use, it was discovered that this did not best reflect the way data was collected. This difference between the structure and the collected data produced a performance bottleneck when dealing with the large structures necessary for HCS data. The decision was taken to rework the model to store the acquisition information on Plate instead. The structure was moved in the model to below Plate and renamed PlateAcquisition. Index was also added to WellSample at this time. 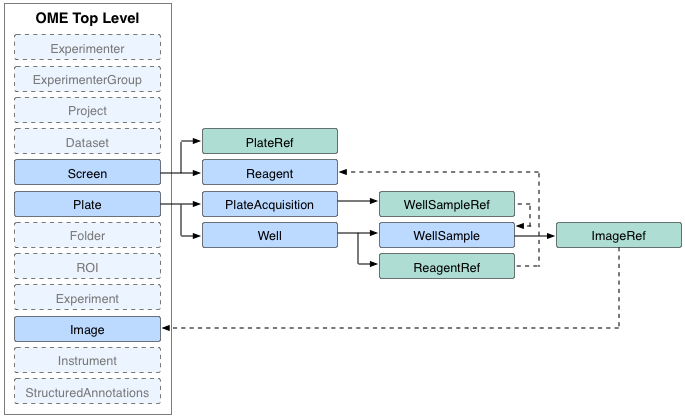 This records the order of the well samples and should be unique within a given Plate. It does not however, have to be sequential so supports the collection of sparse datasets. 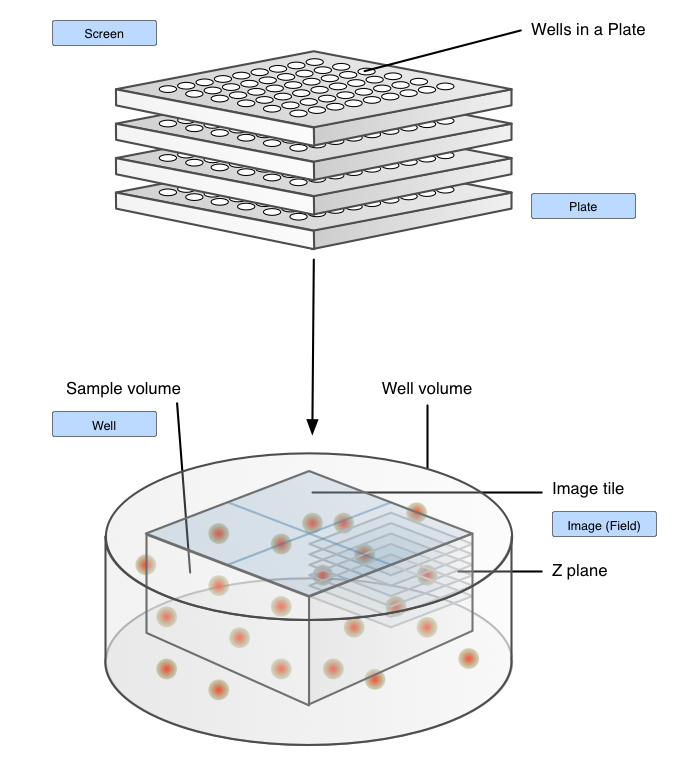 Within the OME data model Screen, Plate and Image are top level structures. A file can contain multiple instances of these elements. Each Plate can contain multiple Wells, PlateAcquisitions, and ScreenRefs i.e. a plate can belong to multiple screens. Each Well in turn can have one (or zero) ReagentRef, and zero or more WellSamples. Each of the well samples defines the location of an image within the well, and the time at which the sample started to be collected. It also references the Image itself. Each Screen contains multiple Reagents, and PlateRefs i.e. a screen can use many plates. A PlateAcquisition is best viewed as a pass over some or all of the Wells in a Plate, usually associated with some time-point or step in a protocol. It is a collection of individual WellSamples across the Plates collected between two time points. The dashed arrows on the structure diagram show the inter-dependencies between the ‘’Screen’’ branch and the ‘’Plate’’ branch of the schema, as well as the ultimate link to ‘’Image’‘.